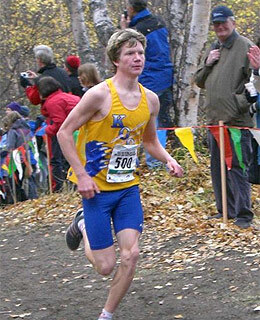 On November 8, 2008, Kodiak AK star Trevor Dunbar ran a 3200 meter time trial on his high school's track that caught the attention of high school fans around the country. It only served to confirm something Alaskans have known for a while now: Dunbar is part of a renaissance in Alaskan prep distance running that the Lower 48 can no longer ignore. The first thing you notice is the banality of the setting, the profound ordinariness of everything. A snow-dusted high school track on a frigid November day. A brushed-nickel sky that emanates light without providing warmth. An aging football scoreboard and a wind-whipped chainlink fence hard against a working class neighborhood. Bundled kids jogging around in mismatched outfits meant to keep the cold at bay. There is a siren wailing plaintively in the distance. An airplane humming on the horizon. This could be any athletic field at any high school in a thousand towns in America. It could be Shamokin, Pennsylvania or Goshen, Indiana or Ogden, Utah. It could be any number of places where high school runners routinely scratch out a few laps on half-frozen, 400-meter ovals in the interest of fitness. This is an island 1500 miles northwest of Seattle, Washington. And someone is pointing a video camera at a quiet, self-effacing teenager in a thin sweatshirt and a black Adidas knit cap. Asking the kid questions, preserving this moment for posterity. In a few minutes the hat will be gone, the sweatshirt will be shed in favor of a yellow long-sleeved jersey layered under a singlet emblazoned with the name of his home state: ALASKA. He’ll be shaking out his bare legs and watching his breath curl into the sky and the snow accelerate onto the track where his father and his friends have shoveled out a roughhewn lane that will shortly be swallowed again in white. The snow, daunting as it may be, is a metaphor—precipitation to match the purity of the effort about to unfold. Trevor Dunbar has just been soundly beaten. Nearly untouchable for the last three years on the undulating hills and rugged trails of cross country courses throughout Alaska, he’s been thumped on the gentle swells of a golf course hugging an industrial strip on the outskirts of Portland, Oregon. This defeat hasn’t come in a race, however. He’s been whipped in a friendly round of 18 by his father and coach, Marcus. They’re in town for the Adidas Classic cross country invitational in mid-October, Dunbar's first trip into the Lower 48 for the 2008 season. The Friday morning golf match was meant to pass the down time before Saturday’s meet. Consider the victory a measure of comeuppance for the elder Dunbar. Only a week earlier, at the Alaska 4A state meet (right), his son laid waste to a course record Marcus had set years ago, while still an elite runner himself. The major difference between the two performances: Marcus Dunbar’s 15:19 all-time mark on the Mike Janacek Trails in Palmer, Alaska, came when he was a post-collegiate athlete sponsored by Reebok. He ran 4-flat for the mile that year on the track. Trevor’s 15:07.8 came in his senior year of high school, competing for Kodiak High School, the team his father has coached for the last ten years. Marcus, too, was taken aback by the effort. In less than 24 hours, at Saturday’s Adidas Classic, Dunbar will run five kilometers faster than any schoolboy in the United States has up to this point in the season. His 14:48 course record will scintillate the Oregon crowd and leave a strong boys’ field deep in his wake. It will be his initial foray under 15-minutes on a cross country course, only serving to confirm something he quietly asserts in the laidback aftermath of that golf match. He pauses, searching for words to capture what this year has been like. You won’t catch Dunbar laying claim to the title of best high school runner to emerge from the Last Frontier state, but that conclusion is getting harder for the three-time state champion to dodge as this harrier season barrels toward its conclusion. The early laps of the videotaped time trial are crisp, even in the deteriorating conditions. Dunbar lopes through the swirling snow at the lead, with teammate Sam Salus trailing in his wake. Salus, bound for the Nike Cross Nationals Northwest Regional in Boise ID, is running a 1600 to sharpen up for the event. Dunbar is going longer—3200 meters, to get in a hard effort before December’s Foot Locker West Regional. His personal best for 3200 meters is 9:06.41 from the 2008 Golden West Invitational, a mark which makes him the fastest ever from Alaska for the distance. But that race was held in early summer in California, at the peak of his track fitness, with heavy competition. This is a time trial in November, aided by teammates jumping in and out of laps as they attempt to keep up, all of them charging into a driving snowstorm. Go Trevor! Someone shouts. Another 68, great job! His smooth, metronomic stride carries him through the mile in 4:32. Salus has faded, but hung tough, running 4:40 in terrible conditions. After the fifth lap, a teammate powers off the line to help with the pacing and accelerates too quickly. Dunbar soldiers on, slowly closing the gap, resisting the temptation to veer from his own internal clock. His 400-meter splits are remarkably consistent. After an opening 69.0, they vary by fractions between 66.9 and 68.5. There is a growing sense that something special is happening here, that Dunbar is laying down a run which is well beyond a simple rust-busting time trial. Man, someone says off-camera, the snow is really coming down. As he rounds the far turn heading into the eighth lap, his father Marcus can be heard in the background, asking for a bell. The request seems slightly absurd, but no more so than attempting to break 9-minutes for 3200 meters on an icy track in a blinding snowfall. Dunbar pursues two teammates into the final lap, dialed in and focused. Go get ’em Trev! someone screams. PR! Any serious discussion about the best high school runner to emerge from Alaska begins and ends with a single name: Don Clary. Clary, a 1975 graduate of East Anchorage High, was a two-time state cross country champion, but it was on the track where he truly excelled. His state 2 Mile record of 9:04.4 still stands today, achieved at an Alaska state meet in which he also set the state mile record earlier in the day. Alaska now contests the 3200 at the high school level, like many other states, but no Alaskan prep has ever approached Clary’s mark, even on the conversion. Until now. Clary’s accomplishments continued well after high school, and it is as much for this as his prep achievements that he’s widely considered the best ever. 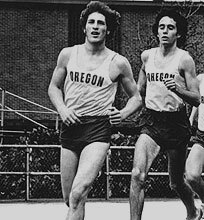 After high school, he attended the University of Oregon on scholarship (right, photo from runningentertainment.com) where he ran alongside Alberto Salazar and Rudy Chapa. He was an All- American three times and a member of the 1977 NCAA Cross Country Championship team. Continuing to train after college, he was a member of the 1984 U.S. Olympic team, reaching the semifinals of the 5,000-meters at the Los Angeles Summer Games. His personal bests include 4:01.30 for the mile (1982); 8:39.44 for the 2 Mile (1981), 8:26.9 for the Steeplechase (1979), 13:27.41 for 5k (1986) and 28:07.01 for 10k (1984). The runner Dunbar is more frequently measured against is West Anchorage standout Miguel Gomez, the only boy from Alaska to qualify for the Kinney/Foot Locker National Championship. 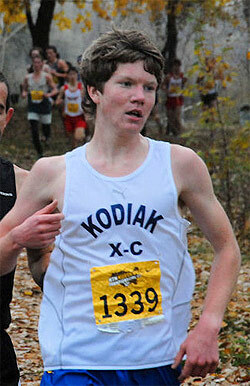 Indeed, a number of the course records Dunbar has shattered this season, including Kodiak’s home layout at Fort Abercrombie State Park, formerly belonged to Gomez. Stronger in cross country than track, Gomez qualified for the 1992 Kinney Nationals as a junior, finishing 13th overall, and setting himself up for a promising senior campaign. Marcus Dunbar, a friend and former high school rival of Alward’s, trained with Gomez in the early 90’s, when the elder Dunbar first returned to Alaska as a post-collegiate athlete competing for Reebok. Instead, the coach has to rely on the watch and his son’s own assessment of his fitness. On the day before Trevor dipped under 14:50 at the Adidas Classic, his assessment was fairly positive. There have been other standouts on the boys’ side, from three-time cross country state champion Chris Gilbert (an accomplishment Dunbar equaled this year) to 1:48 800-meter runner Doug Herron, but the two measuring sticks for Dunbar have been Gomez—for his National championship qualifier—and Clary, for his stunning track marks more than 30 years ago. And really, West Anchorage's Joe Alward says, the measuring stick is Clary. That assessment was made before Dunbar ran 9:01 for 3200 meters in a snowstorm. It took a few days for the video to go viral-- as “viral” as anything gets in the somewhat insulated world of competitive high school running. What began as an emailed YouTube link to Alaskan friends, fans and coaches, eventually spread to the masses via the internet. There was a sprawling thread on the DyeStat message boards. The video was embedded in a prominent location at the top of LetsRun.com's front page. It received a featured slot in the page 1 rotation of Flotrack.com. For almost a week, the grainy image of Trevor Dunbar skirting along the shoveled Kodiak track flickered to life on most of the major running websites around the country. Totally old school, some said. It was tempting to assign even greater significance to the video. To say it represented the challenges of running in Alaska, the hardships and the weather Alaskans typically face. But watching a video shot on Kodiak Island and assuming it “captures Alaska” is akin to watching footage of a track workout in Chicago and asserting you’ve seen what running in New York is all about. The state occupies an enormous geographic space, possessing 20 percent of the land and twice the coastline of the continental United States. November snowstorms aside, Kodiak, in general, has a far milder winter than more northern portions of Alaska. The running is admittedly rugged, but certainly not representational of all of Alaska. 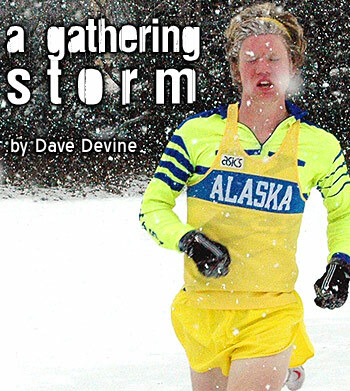 What the runners who compete in Alaska do share is a sense of isolation from the Lower 48, the expense of traveling to meets in such a sprawling territory, and the camaraderie of achievement when their accomplishments are recognized outside the state. He is quick to acknowledge the contributions of others who paved the way for this most recent renaissance in Alaskan distance running, especially the Doug Herron-coached West Valley girls’ teams from Fairbanks that qualified for Nike Team Nationals in 2005 and 2006. It would be one thing if Dunbar’s emergence was an anomaly, a once-in-a-generation athlete from a state that rarely produces top-shelf distance talent. But there is clearly something larger afoot in Alaska. The success of the West Valley girls started a movement among Alaskan high school teams to seek post-state meet competition in the Lower 48. Alward’s West Anchorage team, Dunbar’s Kodiak squad, and Juneau-Douglas, among others, have traveled south to face stiffer competition. And for the three years Dunbar has dominated the boys 4A cross country scene, the girls have also witnessed only a single titlist. Juneau-Douglas junior Leah Francis (#590 at left, photo by Robert Rosenberg) has been as overpowering as her Kodiak counterpart, and stands a good chance next fall of matching Emily Ransom and Kristi Klinnert as Alaska’s only 4-time state cross country champions. 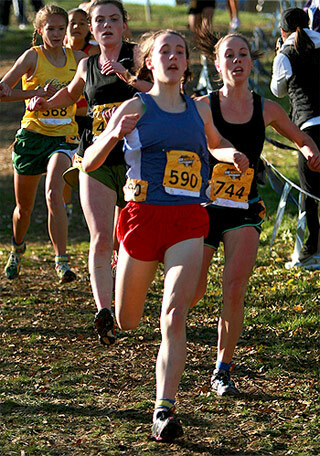 Francis, who might otherwise be a candidate to join Alaska’s two female Foot Locker qualifiers— Ann Locke (1980) and Gretchen Klein (1991)— has elected to eschew the Foot Locker West race this year in lieu of Nike Cross Nationals, which has invited individuals for the first time in 2008. On the eve of the regional qualifying race for that national meet, she was as deferential as Dunbar on the question of her all-time status. If Francis is uncomfortable considering her place in the lineage of Alaska’s best females, Coach Alward is willing to weigh in on the question, and has more than enough perspective to do so. In the final frames of the video, a spent Trevor Dunbar stands before the camera catching his breath. His hair is crusted with frozen snow, his skin raw and wind burnt. His father rattles off the splits from just outside the range of the camera lens. It would be the perfect opportunity for Trevor to pump his fist, thrust a finger in the air, or otherwise exult in his accomplishment. Instead, he blinks and shakes his head. That appreciation for teammates is something he’d expressed a month earlier, on the eve of the Adidas Classic. Asked whether he’d curtailed his training at all before the Alaska state meet, knowing his seasonal goals extended well into December, he admitted he had. He’d tapered his mileage and run the speed workouts with his Kodiak squad as they prepared to defend their 4A team title. This coming Saturday, in the latter stages of the Foot Locker West regional, there’s a good chance he’ll have very few people around him. And if that’s the case, he’ll be just the second boy from Alaska to qualify for the national championship race, and one step closer to cementing his status as the best ever from the 49th state.